با وجود این­که زعفران یکی از گران­ترین گیاهان دارویی در جهان است، اما تاکنون در مورد تولید آن در کشت عمودی مطالعه­ای انجام نشده است. بنابراین رشد و تولید زعفران در دو سیستم کشت متفاوت (عمودی و افقی) در مزرعه تحقیقاتی دانشگاه تربیت مدرس در سال زراعی 1393-1392 مورد مقایسه قرار گرفت. بنه­های زعفران در سیستم کشت عمودی در کیسه­های پارچه­ای در یک مکعب که ابعاد هر وجه آن 5/1 در 5/1 متر بود کشت شدند. در کشت افقی در مزرعه بنه­ها در سه کرت که مساحت هر کرت 25/2 مترمربع بود کشت شدند. نتایج نشان داد که در سال اول رشد تعداد گل، وزن خشک گل و وزن خشک کلاله در واحد سطح در سیستم کشت عمودی به ترتیب 10 گل، 34/347 و 56 میلی­گرم در مترمربع بود که به­طور معنی­داری تقریباً سه برابر بیشتر از کشت افقی بود. در مقابل در سیستم کشت افقی تعداد و وزن خشک بنه­های دختری (به ترتیب 4/2 عدد و 36/0 گرم در بوته)، وزن خشک بنه­های مرکزی (88/0 گرم در بوته) و وزن خشک برگ و ریشه به‌طور معنی­داری بیشتر از کشت عمودی بود، ولی حداکثر طول برگ در کشت عمودی نسبت به کشت افقی بیشتر بود. لذا می‌توان نتیجه‌گیری کرد که از سیستم کشت عمودی برای افزایش محصول زعفران در سال اول استفاده کرد؛ اما باید در مورد بهبود وزن خشک بنه­های دختری جانبی و وزن خشک بنه­های مرکزی در این سیستم تحقیق بیشتر انجام داد. 1M.Sc. Student, Department of Agronomy, Faculty of Agriculture, Tarbiat Modares University, Tehran. 3Assistant Professor, Department of Agronomy, Faculty of Agriculture. Tarbiat Modares University, Tehran. In recent years many research studies have been carried out to use a vertical planting system for production of some plants. Although saffron is one of the most expensive spices in the word, there is no investigation about saffron production in a vertical planting system. Therefore, the growth and production of saffron plant in two different systems (vertical and horizontal) were studied in the agricultural research field of the Tarbiat Modares University during the 2013-2014 growing seasons. In the vertical system, saffron corms were planted in fabric bags containing potting soil. The fabric bags were hanged on a cube of metal with an area of each side of the cube being equal to 2.25 square meters. In the horizontal system, the corms were planted in three plots with the area of each plots being 2.25 square meters. The results showed that in the vertical planting system, the number of flowers, flower dry weight and dry weight of stigma per unit area of land (10 flower, 347.34 and 0.56 mg respectively) were significantly higher than those obtained in the horizontal culture (They were almost three times higher) .In contrast, the numbers and dry weight of lateral corms (2.4 corm and 0.36 g respectively) and the dry weight of apical corm (0.88 g) in the horizontal system were significantly greater than those obtained in the vertical system. Dry weight of leaf and root were significantly greater in the vertical system. The total number of buds and leaves were more in the horizontal culture. However, the maximum leaf length of the vertical planting system was higher than those of the horizontal system. Behnia, M. 2008. Effect of planting methods and corm density in saffron (Crocus sativus L.) yield in Damavand region. Pajouhesh and Sazandegi 79: 101-108. (In Persian with English Summary). Behnia, M.R. 1991. Saffron Cultivation. University of Tehran Press, Iran. (In Persian). Benschop, M. 1993. Crocus. In: A. De Hertogh and M. Le Nard, (eds. ), The Physiology of Flower Bulbs. Elsevier Science Publishers, Amsterdam, Netherlands. p. 257–272. De Villiers, J.J. 2008. The influence of different production systems, planting densities and levels of shading on the yield, quality and growth potential of ‘Chandler’ strawberry plants (Fragaria ananassa) grown in coir. M.S.C. Thesis of the Stellenbosch University, South Africa. Despommier, D. 2009. The rise of vertical farms. Scientific American 301 (5): 80-87. Durner, E.F. 1999. Winter strawberry production using conditioned plug plants. Horticultural Science 34: 615-616. El Behairy, U.A., Abou Hadid, A.F., Medany, M.A., and Awad, M.M. 2001. The effect of different cultivars, orientation, and soilless culture systems on production and quality of strawberries. Acta Horticulturae (ISHS) 548: 59-64. Javadzadeh, S.M. 2011. Prospects and problems for enhancing yield of saffron (Crocus sativus) in Iran. International Journal of Agriculture Research and Review 1 (1): 21–25. Kafi, M., Rashed, M.H., Koocheki, A., and Mollafilabi, A. 2002. Saffron, Technology, Cultivation and Processing. 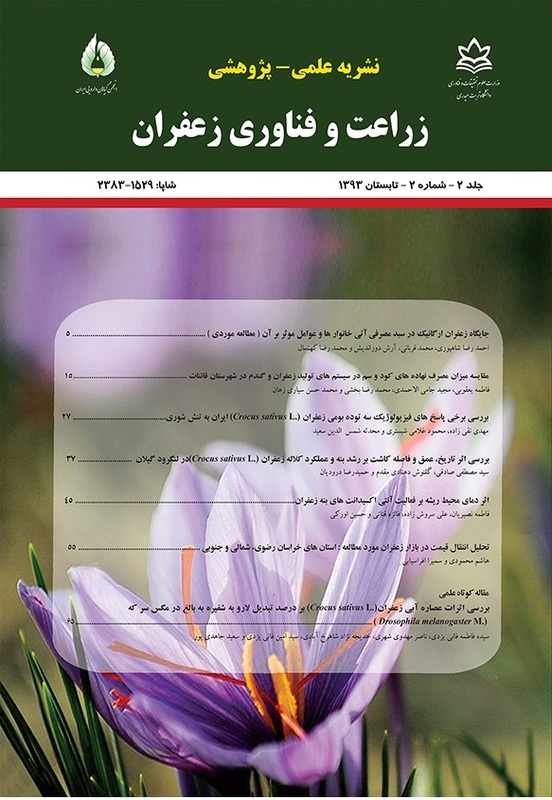 Center of Excellence for Special Crops, Ferdowsi University of Mashhad Publication, Iran. (In Persian). Koocheki, A., Siahmarguee, A., Azizi, G., and Jahani, M. 2011a. The effect of high density and depth of planting on agronomic characteristic of Saffron (Crocus sativus L.) and corms behavior. Journal of Agroecology 3 (1): 36–49. (In Persian with English Summary). Koocheki, A., Tabrizi, L., Jahani, M., and Mohammad Abadi, A.A. 2011b. An evaluation of the effect of saffron (Crocus sativus L.) corm planting rate and pattern on the crop's performance. Iranian Journal of Horticultural Sciences 42 (4): 379–391. (In Persian with English Summary(. Koocheki, A., Tabrizi, L., Jahani, M., Mohammad Abadi, A.A., and Mahdavi Damghani, A. 2009. Peformance of saffron (Crocus sativus) under different planting patterns and high corm density. 3rd International Symposium on Saffron. Forthcoming Challenges in Cultivation, Research and Economics. Korokos, Kozani, Greece, 20-23th May 2009. Moayedi Shahraki, E., Jami Al-Ahmadi, M., and Behdani, M.A. 2010. Study of energy efficiency of saffron (Crocus sativus L.) in Southern Khorasan. Journal of Agroecology 2 (1): 55–62. (In Persian with English English Summary). Morgan, L. 2006. Hydroponic strawberry production (A technical guide to the hydroponic production of strawberries). Suntec (NZ) Limited, Tokomaru, Newzealand. Nassiri Mahallati, M., Koocheki, A., Boroumand Rezazadeh, Z., and Tabrizi, L. 2007. Effects of corm size and storage period on allocation of assimilates in different parts of saffron plant (Crocus sativus L.). Iranian Journal of Field Crops Research 5 (1): 155-166. (In Persian with English Summary). Perez, D.C. 2004. Effect of plant density and initial crown size on growth, development and yield in strawberry cultivars Elsanta and Bolero. Journal of Horticultural Science and Biotechnology 79 (5): 739-746. Rostami, M., and Mohamadi, H. 2013. Effects of planting date and corm density on growth and yield of saffron (Crocus sativus L.) under Malayer climatic conditions. Journal of Agroecology 5 (1): 27-38. (In Persian with English Summary). Sepaskhah, A.R., and Kamgar-Haghighi, A.A. 2009. Saffron irrigation regime. International Journal of Plant Production 3 (1): 1–16. Seyyedi, A., Ebadi, A., Babalar, M., and Saeedi, B. 2010. Effect of planting density on yield and fruit quality of strawberries Selva in soilless culture vertical. Journal of Horticultural Science 24 (1): 1-6. (In Persian with English Summary). Tammaro, F. 1999. Saffron (Crocus sativus L.) in Italy. In: M. Negbi (ed.). Saffron: Crocus sativus L. Harwood Academic Publishers, Australia. p. 53–61. Tavakkol-Afshari, J., Brook, A., and Mousavi, S.H. 2008. Study of cytotoxic and apoptogenic properties of saffron extract in human cancer cell lines. Food Chemical Toxicology 46 (11): 3443-3447. Yanez, P., Ohno, H., and Ohkawa, K. 2005. Temperature effects on corm dormancy and growth of Zephyr elegant. Scientia Horticulture 105 (1): 127-138.